Tom’s energetic teaching style and his passion for painting combine to create a workshop experience that is enjoyable and informative. Any artist looking to break free of a careful, timid painting process will find Tom's direct and representational approach very inspirational. Utilizing his ability to clearly explain visual concepts, Tom will share his pproach and methods for painting bold and interpretive watercolors. Within this process, students will learn how to create stronger, more effective visual statements. Each morning will begin with a discussion covering various topics and culminating in a demonstration that allows participants to see how Tom approaches a work from start to finish. Subject matter may include landscapes, street scenes with people and the clothed figure. Ample opportunity is provided for everyone to paint with individual direction/guidance a priority. Each day will end with a class critique to afford students the opportunity to learn from the works of others. Tom welcomes all painters regardless of experience. 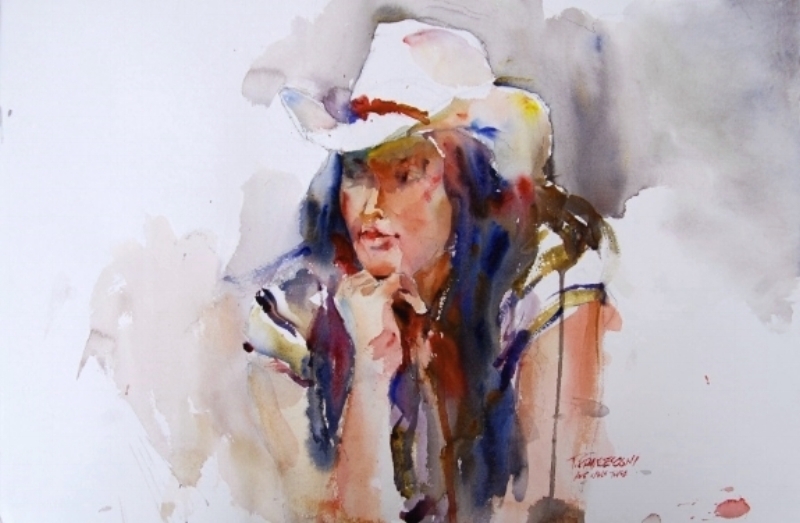 REGISTER for the Tom Francesconi Watercolor Workshop (Folsom CA) by submitting the fill-out form below. If you are on a wait list for the class ... hang tight ... we'll get back to you as soon as there is an opening. Cancellations before June 30, 2017 will be refunded minus $50 administration fee. No refunds after June 30, 2017. Exception: if we have someone on a wait list or you can provide your own replacement.